Courtesy of the Bossier Sheriff's Office | A look at the Red River South Marina on June 6, 2015. NWS now predicts the Red River to crest at 37 feet Monday morning. As of 4 p.m. Sunday, the river was at 36.56 feet. Officials anticipate backwater flooding to occur at Lake Bistineau, possibly rising another two feet, similar to that of 2009. The lake has now been closed to boat traffic, due to rising waters, according to Bossier and Webster officials. Camp owners along the lake are advised to closely monitor the situation as the water rise and take proper precautions. Residents in south Bossier Parish south of La. Highway 527 need to be prepared for backwater flooding that could occur this week. Water is already on some of the roadways in south Bossier Parish, including Atkins Clark Road and Levee Board Road. We will keep you notified of which roads are having issues. Another sand bag distribution site was established Sunday at 3 p.m. at the Tooke Memorial Library in south Bossier Parish at 451 Fairview Point Road. Help with loading sandbags will be from 7 a.m. to 7 p.m.; however, sand bags will be available here 24 hours a day. River Bluff – about half of the 25 residents have water in their homes…some possibly more as the water rises. Cash Point RV Park– all residents of about 50 RVs and trailers have evacuated – water throughout. Cash Point The Party Place – water is inside the business. Buckhall Road – about 10 homes in the area just north of Cash Point have seen flooding or have water or have water very close. Ash Point near Taylortown – 1 house has water, 1 getting sandbagged. 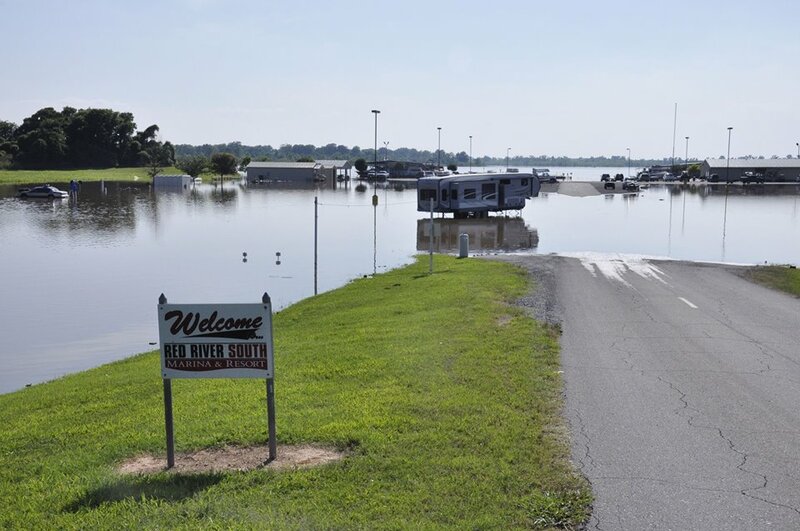 Red River South Marina – some trailers, vehicles and cabins have water. Ranchers moved 65 head of cattle across 4-lane Highway 3 Sunday morning around 10:20 a.m., a unique outcome of the historic flooding on the Red River. Bossier deputies blocked traffic near Magnolia Chase subdivision so the ranchers could move the livestock from Leflett Cattle Co. from land flooded by the Red River to dry ground across the highway. (Link to video attached). Officials highly recommend anyone in danger of flooding to evacuate. War Veterans Home – officials are monitoring the situation closely. No evacuations at this point. DOC inmates will fill sand bags around the clock at the Bossier Parish Highway Department Maintenance Barn in Benton. National Guard Soldiers will fill sand bags at the Bossier City Public Service Complex on Old Shed Road. Sand bags remain available at the Elm Grove Elementary School 24 hours a day. La. 537 in north Bossier Parish from Pittman Road to Log Ferry Road. La. 515 in south Bossier Parish from the Loggy Bayou Bridge in Red River Parish to U.S. 71 in Bossier Parish. Shreveport Barksdale Bridge off ramps to Arthur Ray Teague Parkway. Arthur Ray Teague Parkway in Bossier City from just south of Shreveport-Barksdale Bridge to Centurylink Center. I-220 outside lane westbound from Benton Road to the Red River. Bossier deputies, officials with La. DOTD, Bossier Parish Police Jury and Bossier City Police Department continue to monitor all roadways, especially those in south Bossier Parish and low lying roadways. The evacuation shelter operated by the American Red Cross at Elm Grove Elementary School continues to remain operational. American Red Cross and Salvation Army continuing to render assistance at the shelters and for first responders and others diligently helping in the flood fight. Bossier Office of Homeland Security and Emergency Preparedness encourages residents to document any damage due to flooding by writing it down, taking photographs or video of your damage and retain any receipts pertained to cleanup and restoration. If you’ve experienced any damage to your home, business or property, call BOHSEP at 318-425-5351. Officials encourage all residents who might be in jeopardy of flooding to ensure they have an emergency plan in place and take appropriate actions now. Officials are urging residents to understand the scope of the flooding, in which high waters will be in our area for the upcoming weeks.